Miami University students master LinkedIn connections. On their way to 500+. Anyone taking my classes over the past eight years knows I often get on a soapbox about the importance of their LinkedIn profiles. A great profile gets noticed and helps launch your career. I also set a goal of 500+ connections before graduation, but only one in three usually reach that benchmark number. 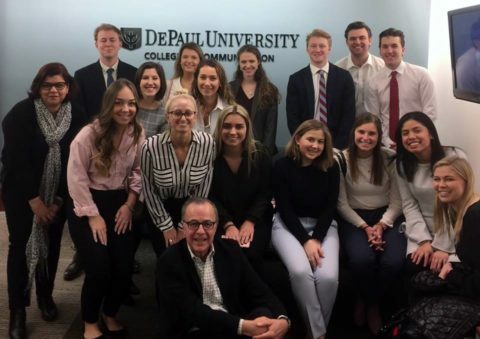 Recognizing the importance of LinkedIn, DePaul’s PRSSA chapter meeting last night featured career specialist Michael Elias, assistant director of the Career Center at DePaul University. Michael discussed profile essentials and strategies for making connections on the platform. With 85% of all jobs getting filled through networking channels and more than 90% of recruiters using LinkedIn, the importance of this platform cannot be ignored. The fully engaged Miami undergrads clearly understand the power of LinkedIn. I predict they’ll land great jobs upon graduation. Want further proof of the power and importance of LinkedIn? Check out these LinkedIn statistics.